Europe’s raging migrant crisis is set to hijack a summit in Vienna of leaders from the Western Balkans region on Thursday (27 August) that will also be attended by German Chancellor Angela Merkel. But the “Western Balkans route” has now become one of the main ways into the European Union for the several hundreds of thousands of migrants entering the bloc this year in Europe’s worst refugee crisis since World War II. Some 102,000 migrants entered the EU via Macedonia, Serbia, Bosnia and Herzegovina, Albania, Montenegro and Kosovo between January and July this year, versus just 8,000 for the same period in 2014, according to EU border agency Frontex. 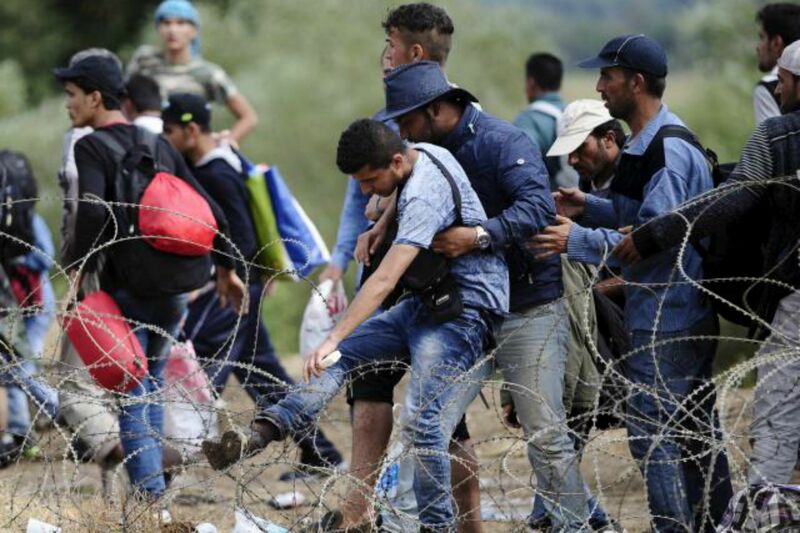 Last week, Macedonia declared a state of emergency after being overwhelmed by the volume of refugees entering from Greece, closing the border for three days as police used stun grenades to stop people breaking through. At least 7,000 people have since made it to Serbia, hoping to follow the roughly 100,000 others who have crossed over into EU member Hungary this year before a razor-wire barrier is completed by 31 August. Summit host Austria, which borders Hungary and fellow “front line” state Italy, will present a five-point plan at the conference. It involves doing more to tackle people-trafficking gangs, a “fairer” distribution of refugees around the EU, greater security cooperation, helping the countries where the migrants come from and a “pan-European asylum strategy”. “It’s a humanitarian disaster, a disaster for the European Union as a whole, and there is a pressing need for us to focus on the situation in the Western Balkans,” Austrian Foreign Minister Sebastian Kurz said on Monday. “We have to find a new strategy to support Greece and the Western Balkan countries,” Kurz said on a visit to see the crisis in Macedonia for himself. But it’s not just about people fleeing violence in places like Syria, Iraq and Afghanistan. The impoverished countries in the Western Balkans are themselves the source of huge numbers of migrants. Of the 44,000 irregular migrants detected crossing between Western Balkans and the EU in the first quarter of 2015, 27,000 were nationals of the region, according to Frontex. According to Dusan Reljic at the German Institute for International and Security Affairs (SWP), this is because the economic situation there is “disastrous”, with growth non-existent, unemployment sky high and investment feeble. The credibility of prospects of these countries joining the EU “has largely evaporated, and the poorest of the poor have abandoned hopes of improvement and ever achieving a life with dignity”. It’s terrible to see what the terror of islam has accomplished in Europe. After a period of increased freedom and unification, after we finally got the same coin and ease of travel, after we got rule of law but still privacy, this is increasingly being robbed because of these delusional disorder patients called muslims. Now there is less safety, less unification, the governments are spying on us because our neighbors could be terrorists and there is even talk about enforcing borders again between our brother EU citizens. It is clear to us that the root of this problem is islam. An ultra violent mental disorder and highly infectious among the weak and confused it acts like locusts. In their madness they build up to a rage and after there is nothing left but a bloody desert they will move on the next paradise of freedom and happiness to prey on. We demand our freedom back, our tolerant society, our privacy, the right to move freely in Europe without borders and increase our prosperity, social rights and development of our superior society and culture. It’s clear these demands can’t coexist with islam, as this has been proven for centuries of war, dictatorship and genocide within every muslim society. They don’t want it and we don’t want them! I don’t want free open migration across the EU We in the UK have been forced to absorb 2 million economic migrants from the EU in a very short period & received no help from anyone to deal with the menace of vast numbers of culturally different none English speaking migrants. Now when the boot is on the other foot they want us to open up & take in millions more simply because we are large economy. We are a constantly being told we are tiny country no one listens to anymore. Indeed we are tiny country & over populated too so we want nothing to do with the EU’s lunacy. If you want law & order you obey the law & order in place which is the Dublin agreement which clearly states those seeking asylum must do so in their first place of call not pick & chose. We didnt elect their governments, they did, their beliefs put these lunatics in power, not ours! Just like the swarms of EU migrants they do not want to be a part of the UK with beliefs, ways & our sensibilities. They want to maintain their culture, not playing cricket or joining the rotary club but Islam & it’s evils. Bloody French who came here as economic migrants… Or the Brits who went to Spain in the hundreds of thousands in the same vein… People should always stay within 50 miles of their birth place for life – right? Ban the cars and aeroplanes while you’re at it and there you have it, climate change problem also solved. This Vedic astrology writer has been focusing for several months back on problems revolving around migrants leaving their country in quest of refuge in foreign countries. Reasons for moving over to foreign countries may vary. In most cases, destination was and is Europe. The prediction of this writer has been that planetary impacts for the period from November 2014 to mid- 2016 if not until mid 2017, suggest a growth of the problem. It was predicted that during spell from around April 2015 to October 2015 , the gravity could be rated as intense. And this has been seen to be supported by actual happenings on the ground. A question arises about way out or solution. Planetary position during the aforesaid period suggest this answer – Either accept the destiny or adopt a well orchestrated strategy to obtain support or goodwill of the global community. In any case, the indication seems to suggest that problem could amount to pain to such migrants and to some extent, to their host as well who have also to ensure that only a genuine migrant is allowed in. If sea falls on way to destination, again take particular precautions and avoid haste against imaginable risks , as far as possible. Above all, it must be remembered that time is a great healer. every one I know works for the benefit and needs of there families yet you expect people to put the needs of the refugees and migrants before that of there own….. did you or did you not get elected to look after the interest of your own.. or that of migrants and refugees who did not vote for you or support you…??????? ?.